The breakthrough for the MBR came in 1989 with the idea of Yamamoto and co-workers to submerge the membranes in the bioreactor. Until then, MBRs were designed with the separation device located external to the reactor (side stream MBR) and relied on high trans-membrane pressure (TMP) to maintain filtration. See Figure 2, with the membrane directly immersed into the bioreactor, submerged MBR systems are usually preferred to sides tream configuration, especially for domestic wastewater treatment. The submerged configuration relies on coarse bubble aeration to produce mixing and limit fouling. In submerged configurations, aeration is considered as one of the major parameter on process performances both hydraulic and biological. Aeration maintains solids in suspension, scours the membrane surface and provides oxygen to the biomass, leading to a better biodegradability and cell synthesis. This led to a further development of MBR system. A sample configuration of a developed process is shown in figure 3a and Figure 3b shows the water circulation of three submerged modules with perspective view of the modules depicting components inside. Most important aspect of MBR technology is production of very high quality effluent consistently. Compliance with International stringent discharge norms. Complete independent control of HRT (Hydraulic Retention Time) and SRT (Sludge Retention Time), which allow more complete reduction of COD, and improved stability of processes such as nitrification. Process intensification through high Biomass concentration with MLSS (Mixed Liquor Suspended Solids) over 8000 – 10000 ppm. Ability to treat high strength wastewater. 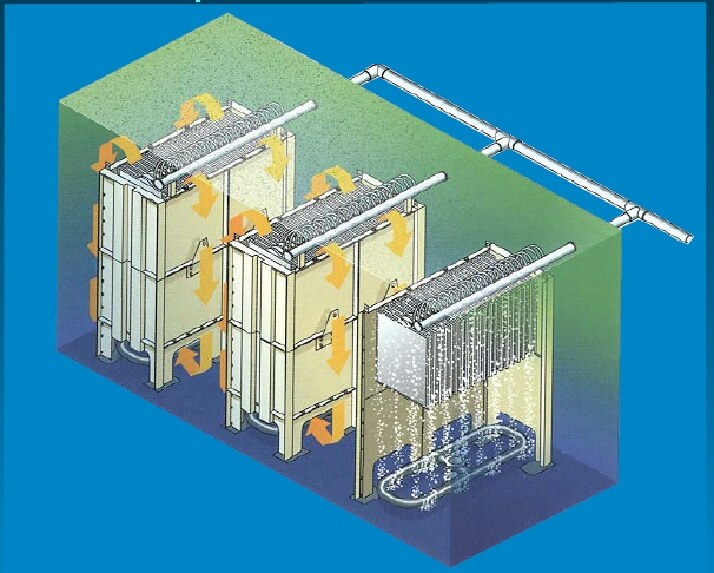 Lower footprint than Conventional Activated Sludge Process, since Clarifier/Filters are eliminated. Reduction in Post disinfection requirements. Due to above advantages & recent technical innovations and significant cost reductions the applicability of MBR technology in municipal wastewater treatment has sharply increased in Europe, America, Middle East & China. MBR system is now widely used in industrial applications equally. Large MBR systems are normally built with Hollow Fiber or Tubular membranes & smaller installations prefer Flat Sheet membranes.